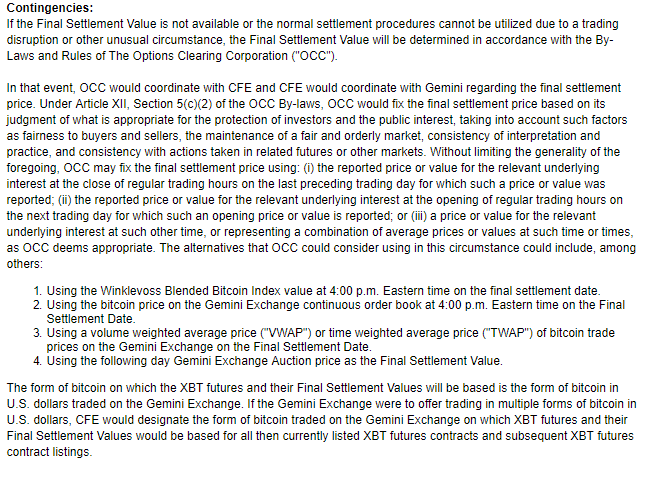 The CBOE Futures Exchange or CFE will start trading bitcoin futures under the symbol XBT starting Sunday, December 10th 2017. It is a non-deliverable cash settled contract that uses the Gemini Auction price to settle at NYC close on expiry. The contract sizes are notionally 1 contract = 1 btc, with contracts being valued at $10.00. The max position size of any single participant/firm is 5,000 contracts total, with only 1000 contracts being in the front month on the week of expiry. Q — What is the volume of CBOE/CFE vs CME ? Q — What do you guys think about the pricing mechanism on this product ? A — Our opinion is that its pretty poor at this point vs other proposed mechanisms. The Gemini Exchange , while being a solid US based exchange, makes up a very small percentage of the global volume. More importantly, the auction itself sometimes has days where it has low volume or doesn’t complete at all . This really doesn’t represent the price of bitcoin in these cases. There is language in the product spec that says that they can settle using other mechanisms in the case of a failed auction such as using the WinkDex, bid/ask spread of Gemini, or a vwap solution. The question of how the future is settled in these cases makes harder for others to externally price it. Note — it is probably the hope of Gemini that with a future attachment to their exchange, that larger sizes will go through the auction as times goes on. liquidity begets liquidity. However, we have to look at what we are presented now. Q — Is there margin/leverage being offered ? A — Yes. Well kind of. Clearing firms are so concerned are about the regular 10% — 30% moves in bitcoin and the risk of cascade liquidations that they are (as of this writing) refusing to list it,at least for the first week. The margin requirements are a bit expensive for the XBT product — coming in at 33%. Leverage offerings will vary based on the brokerage. We are being told that 3x is the standard offer. Also, since the minimum tick is 5 dollars. It very possible are that liquidations are hit in groups. Q — What does minimum tick size mean ? 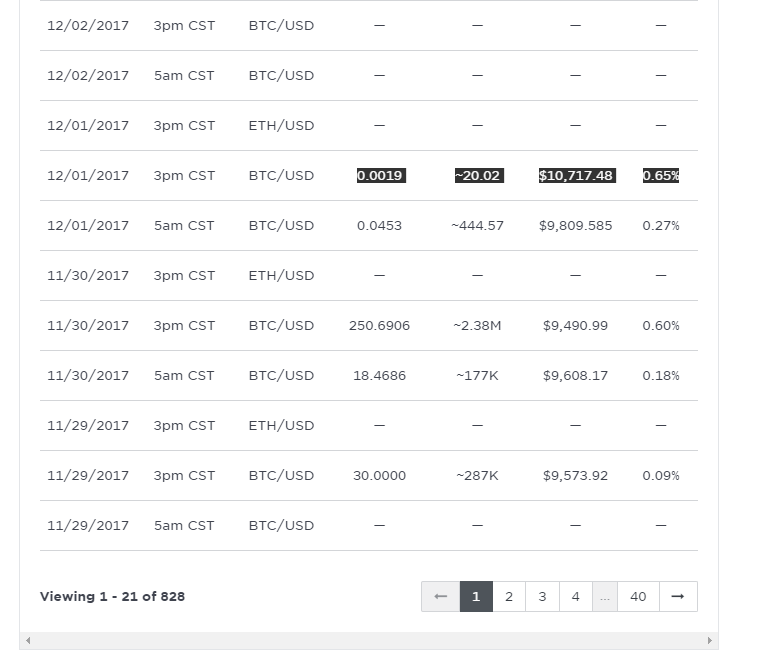 A — In the bitcoin underlying, you can trade bitcoin out to penny increments. In futures, they tend to use larger tick sizes in order to pool liquidity. This helps larger orders get filled. This also means that if the underlying ticks to down 4 dollars, the there is actually no realized for another dollar. Q- What hours will the futures trade? A — the future will trade that standard hour of Sunday open to Friday close in forex fashion. Q- Doesn’t that mean there a risk for gaps up and down on Sunday open ? A — Absolutely, just like in forex products. Bitcoin tends to get huge moves Friday into Sunday. Q — Do you think the ability to short is bad for bitcoin ? 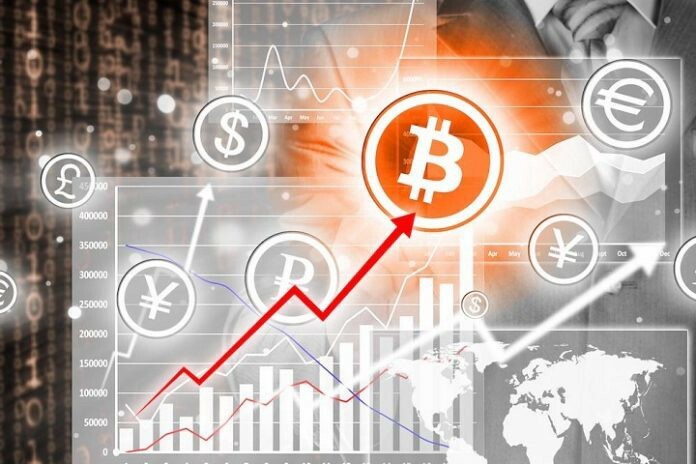 A — First, traders have been able to short bitcoin since 2013 , despite what main stream media has been reporting. Millions were made shorting the 2013 GOX collapse. Here is one story of such a trade . 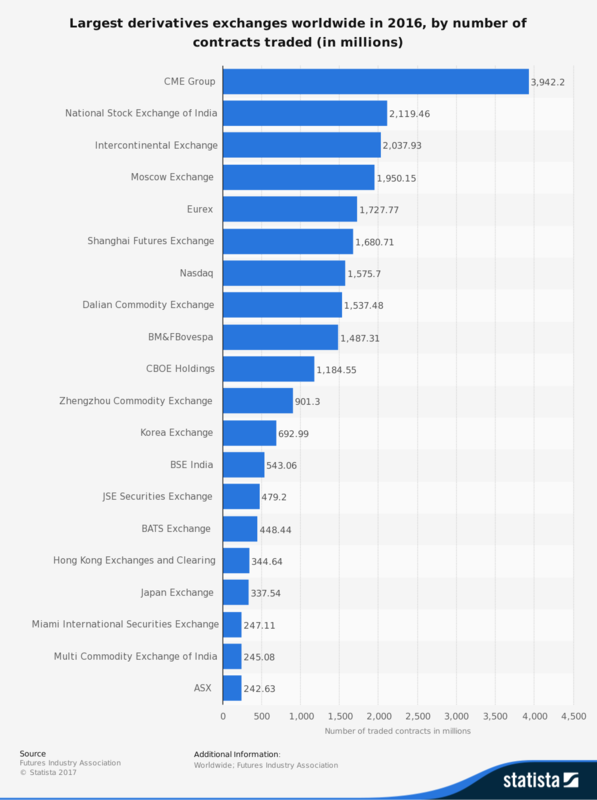 Retail exchanges such as Bitfinex, OkCoin futures, Bitmex, and some china spot exchange are some venues you could have shorted on since then. As far as the CBOE offering is concerned, we think that professional hedgers are going to do what they do. Given the concern of margin, it is unlikely that banks will jump in right away because it doesn’t fit their risk model. Q — With having the ability to short, do you think that Wall Street will just come in and sells bitcoin down? A — The pricing is based on the underlying auction mechanism. To sell something down, you need supply to do so. Most of the ‘talkers’ on this point have not been allowed to hold crypto due to compliance issues and concerns (ie mutual funds). So, we view this as a minimal risk. However, it is possible for the future to trade at a premium or discount anywhere up until settlement. This is usual behavior for a contract. For more info, google future forward curve. Also the current accepted price of bitcoin is derived from the actual underlying trades in a free market. Cash for coin. Unlike the price of commodities , such as gold , where its very much influenced by the “paper trading”. We don’t see this changing in the near future. Q — What differences should we expect trading a regulated futures vs current offerings ? A — The major trade impacting difference we see is the circuit breakers required by regulatory bodies. The idea behind these is to limit market volatility and cap upside and downside risk. When these are hit, trading is halted for a period of time to be determined by the exchange. The futures price generally slows down in these cases once trading resumes. However, the underlying market will keep going. This is very important to keep in mind as bitcoin tend to do 15% — 25% moves regularly. It is possible for a circuit breaker to be tripped multiple times in a day. The other thing to keep in mind is that trades can be broken on a regulated exchange aka busted. 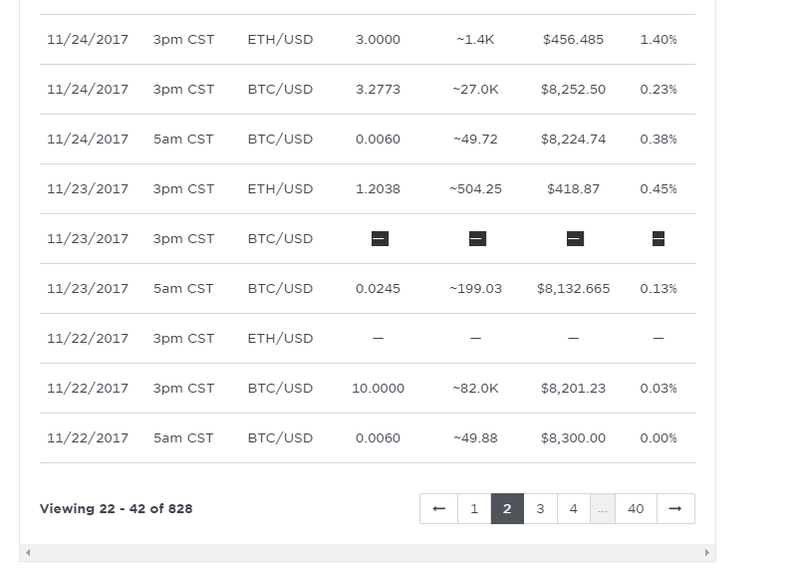 On a normal crypto exchange, if an order is fat fingered — it’s yours. They are irreversible. On a regulated exchange, you can phone a support guy and if it qualifies — it reversed. Q — Are there any manipulation concerns ? If you enjoyed our article series so far , we accept bitcoin and ethereum tips which go towards funding WhaleCalls project(s).